Washington (ANA-MPA/T. Ellis) – Greek Ambassador to the United States, Alexandros Mallias, on Wednesday hosted a reception at the ambassadorial residence in honour of outgoing director of the Greek Embassy’s Press Office in Washington, Achilleas Paparsenos. 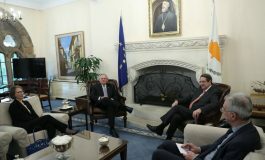 During his ten-year tenure in Washington, Paparsenos cooperated closely for the projection of Greek positions in the American mass media, with four ambassadors: Loukas Tsilas, Alexandros Filonas, George Savvaidis and Alexandros Mallias.